One of the best things about coffee is the sheer variety of flavors you can get with coffees from different growing regions and with different roasts. When you get your hands on a new coffee it can be tough deciding where to start with a recipe. We always recommend asking a barista or roaster when you can. If all else fails, there’s a simple rule of thumb that’ll help you get the most out of your coffee. Here we have some of our favorite coffees. One’s a dark roast, one medium, and one light. 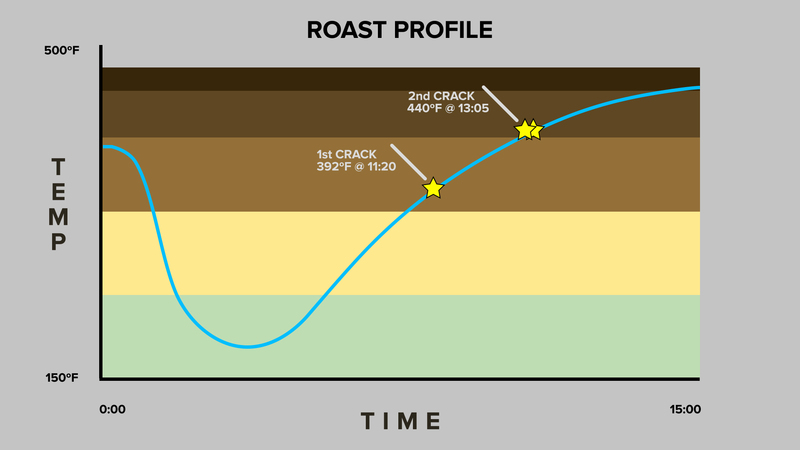 Generally speaking, roast profile has the greatest impact on what recipe you should choose. For all of these, we’ll be using a 20-gram basket with this LUCCA M58 V2, so we’ll be using a 20-gram dose to match. The simple thing to keep in mind with different roasts is that as you roast a coffee the beans become more porous and certain compounds breakdown. Because the bean becomes less dense as you roast, it becomes easier for water to pull the delicious dissolvable solids out of the grounds. In effect, it’s easier to pull flavors out of a dark roast than it is a lighter roast. With that in mind, let’s start with the medium roast: Cat & Cloud’s Night Shift Blend. When I’m working with a medium roast I always start with a recipe that’s right in the middle of that road. This is our standard “Clive Recipe” that we recommend all first time home baristas start with. My goal is to pull a shot with a 1:1.5 ratio of coffee to water which translates to a 30-gram shot. I’m also going to keep the PID at a temperature of 200°F, which is right in the middle of the optimal temperature range for brewing. I’ll use this recipe as a guideline, dial in my shot, and then make adjustments based on taste. Let’s move over to a dark roast: Verve Bronson French Roast Blend. The nice thing about roast levels is that, even if there’s nothing on the bag, you can tell what the coffee needs just by looking at the beans. Looking at these, you can clearly see it’s a darker roast. Since this is a dark roast, we want to be a little bit gentler with our recipe to ensure we don’t over extract and get flavors we don’t want. 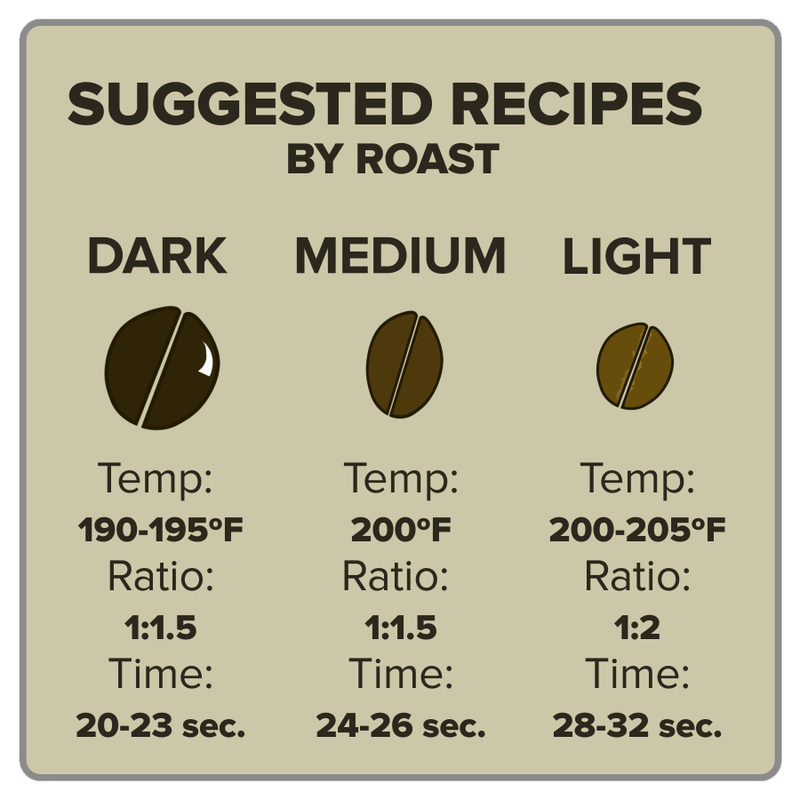 When I’m working with a dark roast the first thing I want to do is adjust the temperature a few degrees lower, starting at 195°F. I’ll also keep my brew ratio the same but adjust my grind such that I get that same 30-gram output in around 22 seconds. Both the lower temperature and shorter brew time help reduce some of the bitter aspects of a dark roasted coffee. This way the shot is a bit sweeter and smoother, with those chocolate and molasses notes coming through. Last let’s pull shot with a light roasted coffee: Olympia Coffee Roaster’s Little Buddy Blend. Once again, a glance at the color of the beans makes it clear that this is a lighter roast. This is one of our favorite coffees around here, we try to make sure we always have a bag on hand. Because this is a lighter roast, it’s more difficult to pull flavors out since the beans are denser. With this in mind, I’ll start with a slightly higher temperature of 203°F. I tend to prefer lighter roasted coffees pulled with a slightly higher ratio, so I’m going to aim for a 1:2 ratio with a yield of 40 grams of liquid espresso and a longer shot time of 28-30 seconds. By increasing our time and temperature we’re ensuring that we get all the flavors we want from our coffee. If I were to use our dark roast recipe for Little Buddy the shot would come out tasting super sour and salty. This recipe will result in a more balanced, sweet shot that I’d be glad to drink or serve. All three of these shots came out nicely, but in coffee, there’s almost always room for improvement. These recipes serve as a good guideline but after tasting my first shot I’ll almost always make slight adjustments to get that little touch of extra sweetness or brightness out of a coffee. Adjusting your temperature or shot time by a second or two at a time is a great way to explore what a particular coffee has to offer and find that perfect balance that we’re all chasing.